I read an interesting article on Bloomberg.com about a "Giant" oil discovery made recently by U.S. Oil Giant BP in the Gulf of Mexico. One estimate in the article is that the newest find is somewhere in the area of one billion barrels of oil. The article mentions that Oil companies are going to greater lengths to reach oil once thought to be impossible to obtain. The reasons mentioned for this are dwindling supplies of domestically produced oil, and reluctance of other counties in the Middle East and South America to allow U.S. oil producers to tap their reserves. Reading this article made me wonder "where" U.S. Oil basins are located, and how many of them there are. In this example I have collected data on U.S. Oil Basins from the Energy Information Administration so that we can get a look at where U.S. Oil reserves are located. Also I conducted a brief analysis to determine which Oil basins were the largest in total area. I have included several screenshots that depict this analysis. In the first screen shot you can see all of the U.S. Oil Basins across the country. In the Second you can see oil basins in Alaska. In the third you can see oil basins in the lower 48, and in the last screen shot you can see how the oil basins stack up to one another in terms of total area. You can see that most of our oil basins fall in the smallest area category. However, it is important to point out that the area of an oil basin does not necessarily determine how much oil can be retrieved. 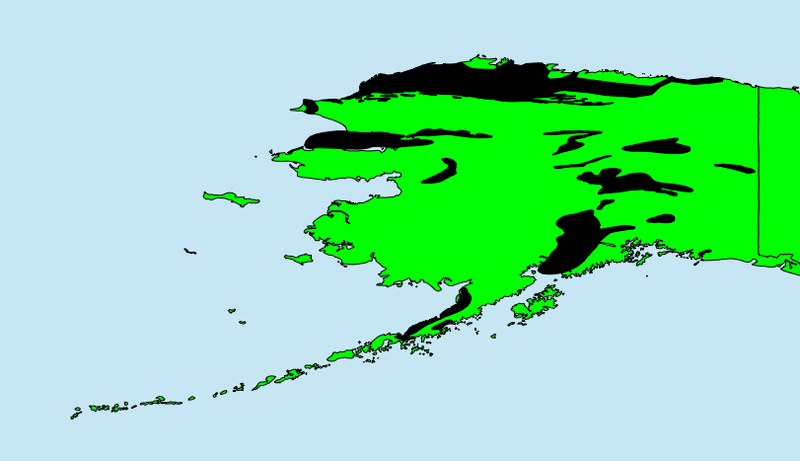 The oil fields in Alaska are cited as the most lucrative in terms of total oil that is able to be produced.